Photos by Brandon Macz: F45 Training focuses on high-intensity group workouts that are never duplicated. The Queen Anne F45 is the first of several locations franchise owner John Bankson plans to open in Seattle. F45 Training has reached the Pacific Northwest from Down Under, with a new franchise location opening up in Queen Anne on Saturday, Jan. 26. F45 was founded by Rob Deutsch, who opened the first training club in Sydney, Australia, in 2013. There are now 1,500 locations in 39 countries. Queen Anne F45 can be found in the former Nancy’s Sewing Basket space at 2221 Queen Anne Ave. N., and is the first Seattle location to be opened by franchise owner John Bankson, who also has plans to open training facilities in Northgate, West Seattle and Judkins Park. Deutsch was an equities trader before he started F45, and Bankson was an account executive at Presidio before he also decided he was done with the corporate world. “I want to do something that I feel good about doing,” Bankson said. He describes F45 as filling the gap between group training and high-end personal training, and a great replacement for Crossfit, which the 46-year-old entrepreneur had done for years. F45 practices the same community aspect with its group training, he said, and members will need to show up for scheduled sessions, which are switched up every day and practiced by all F45s around the world. People are guided through a series of intense 45-second exercises with a focus on functional (that’s the F in F45) training. Workouts are developed from a pool of more than 3,000 exercises. Each quarter about 250 new ones are added. Circuit-based training will be broadcast on television screens and demonstrated by in-person trainers who can help members with their movements, adjusting pace and correcting bad form, said Katie Addison, studio manager for Queen Anne F45 Training. F45 focuses on more cardio, less heavy weights, but higher reps, Bankson said, with three days set for strength resistance, three for cardio and a Saturday hybrid that includes a live DJ. People don’t have to sign up for a lengthy contract, he said. Body scans are offered to members, so they can see the results of the F45 system. Members can track their nutrition through an F45 app that also provides healthy recipes. Bankson said he’ll be contracting with a meal-prep service that will be available to members needing help on that end. F45 is working on a global system that would let members use other facilities when they’re traveling, Bankson said,but currently people would need to pause their membership and pay a day fee if working out at another F45 Training location. Seventy people have signed up at the Queen Anne F45 so far, and another 600 plan to take a trial session, he said. 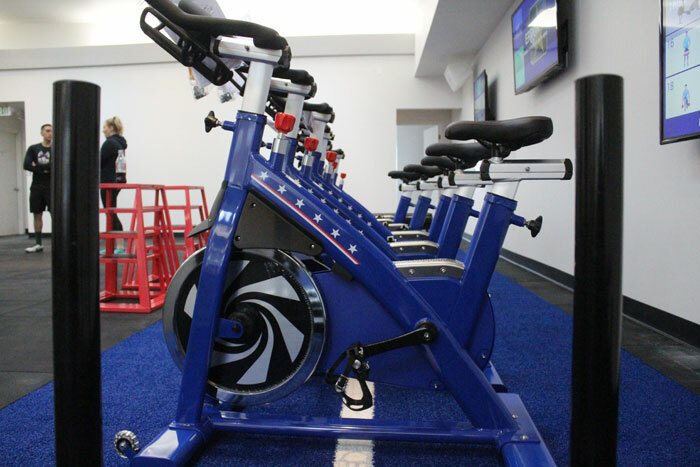 F45 will open Wednesday, Jan. 23 to those who joined early. Bankson has spaced leased in Northgate, where he’ll launch his next F45 Training location. He’s currently scouting locations near Judkins Park. Find out more about F45 at F45training.com.